Tea or coffee themed single greeting cards and Thank yous. 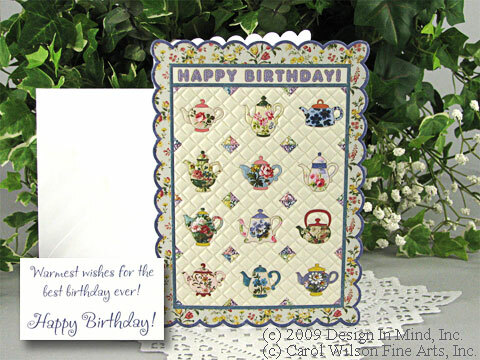 Happy Birthday card with teapot embossed quilt design. Envelope size 5 x 7 inches. 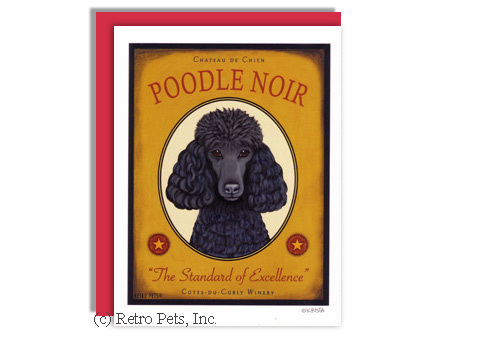 Is Poodle Noir a graceful, cheerful wine, like the proud dog it is named for? 5.5" x 4.25" blank greeting card with red envelope. 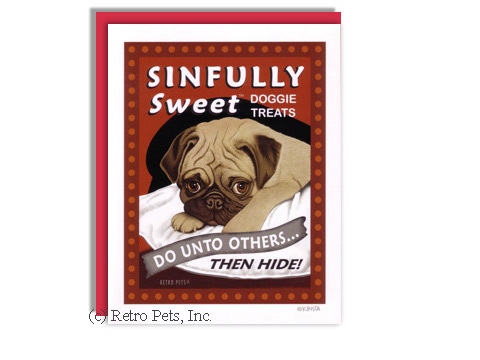 Sweet Pug, but aren't they all. Those big beautiful eyes distract their owners from the sneaky things they have done. 5.5" x 4.25" blank greeting card with red envelope. 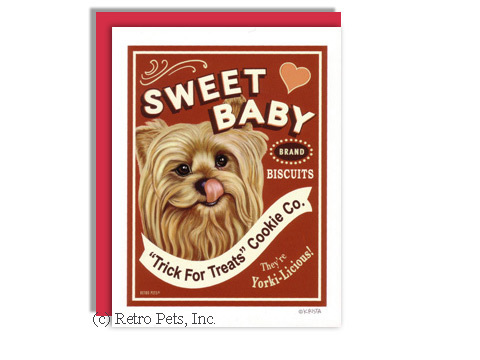 What tricks will your Yorkshire Terrier do for biscuits? 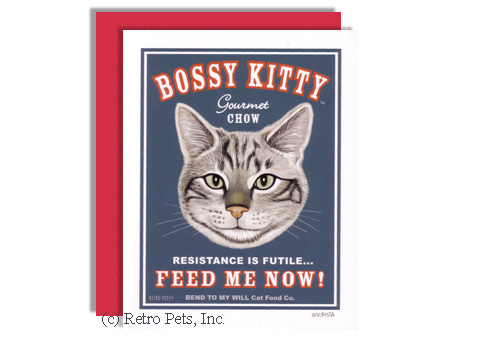 5.5" x 4.25" blank greeting card with red envelope. 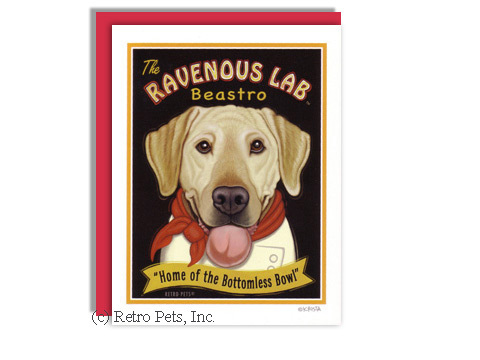 The Ravenous Lab Beastro. It's the place to go when you're as hungry as your Yellow Labrador Retriever. 5.5" x 4.25" blank greeting card with red envelope. Sweet, intense and nutty. 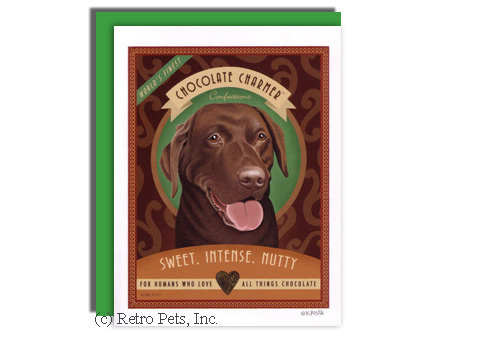 Are we talking confections or Chocolate Labrador Retrievers? 5.5" x 4.25" blank greeting card with green envelope. 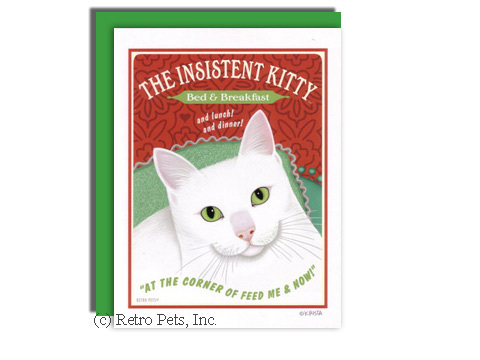 This green-eyed kitty wants his three meals a day served on time. 5.5" x 4.25" blank greeting card with green envelope. 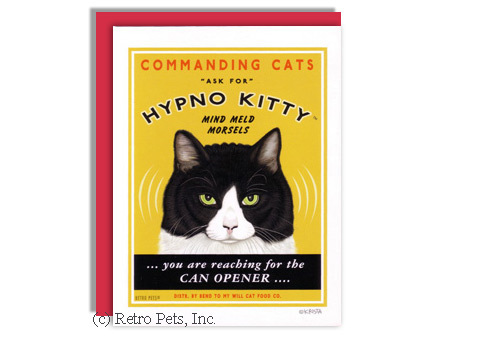 This intelligent tuxedo cat will find a way to encourage you to serve a little something. 5.5" x 4.25" blank greeting card with red envelope. How could you resist this smiling grey tabby's request for food? Resistance is futile! 5.5" x 4.25" blank greeting card with red envelope.